When I first heard about High Fidelity Cables’s magnetic conduction technology, my first thought was a mixture of snake oil with unicorn tears. After listening to their offerings on my own setup and a few others, I’ve capitulated. They even made it on the Discovery Channel. Now, I own many of their power products and always have MC-0.5s and magnetic RCA adapters in the chain. For what it’s worth, I don’t recall a time when these “enhancers” didn’t improve the sound of a system. A few weeks ago I received a random package in the mail from Rick Shultz, the Magnet Man himself. 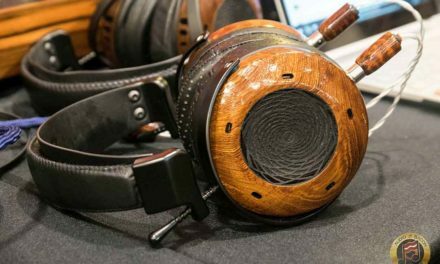 I listened to a (larger) prototype of the Trinity Go at the LAAS 2017 and was impressed at how it improved the solidity of the ESS RLM-713 headphone. 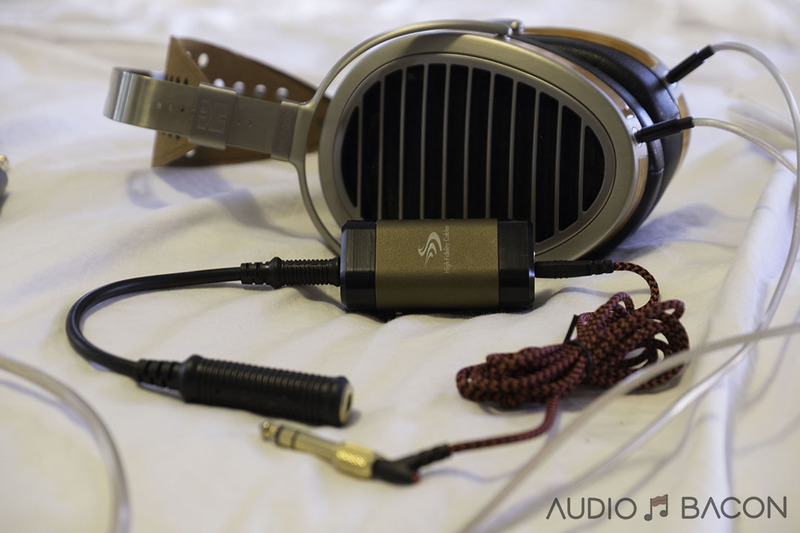 I also reviewed the desktop version of this headphone module, the Trinity Helix, a few months back. So how does the Trinity Go work? You’ll need to provide your own auxiliary cable for the input side of the Trinity Go. As with everything audio, the input cable does matter and I’ve settled with the V-Moda extended which was much better than generics and the Beats aux I found in a rental car. I also used the Grado adapter on the output end for the larger cans. Keep in mind the Trinity Go does not work with 4 connection TRS with microphone, only 3 connection TRS without microphone. Notwithstanding this, I was able to “wiggle” the buds with microphones to get it to work. I’m also sure there are adapters that could be used. This IEM sounds great, especially for the price. It’s very clean, neutral, and dynamic but lacks a bit in the bass department. This is where the Trinity Go steps in. The Trinity Go imparts this calm and relaxed sound, smoothing out all the digital edges and grain. It tames the treble a bit and provides a more natural timbre to instruments and vocalists. Resolution and layering take a slight hit but I feel the Neo sounds a bit more contrived and disjointed without the Trinity Go in place. Overall, the Trinity Go balances out this IEM very well. With the Trinity Go, the 12 Classics surpasses the 11 Neo in musicality. Timbre and tone were already on point with the 12 Classics but it lacked a bit of focus and had a chalky treble. 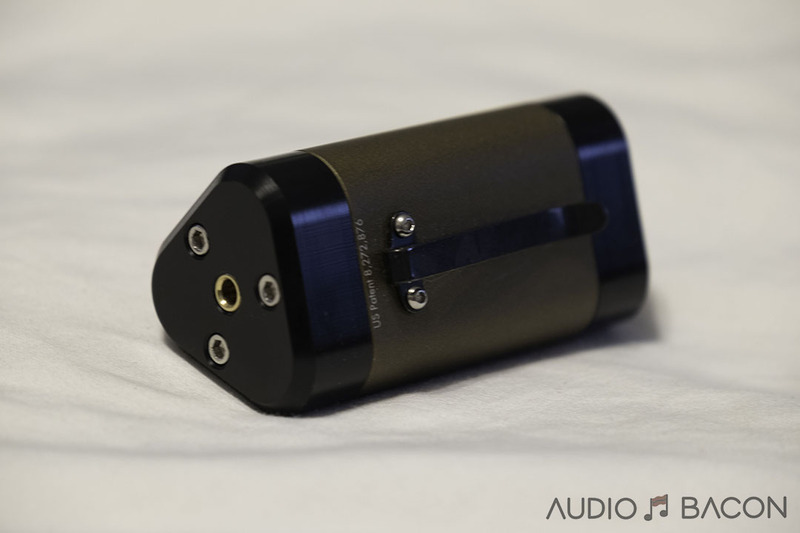 The Trinity Go tightens up the sound and provides that “sonic glue” for better coherence. You’ll get a heftier bass response and more precise imaging. Music just sounds smoother and punchier. Vocals sound more real and natural. There’s also more depth and dimension in the sound field. Swapping out the Trinity Go, the 12 Classics sound a bit gritty and loose. It lacks grip and authority. In short, the Trinity Go provides musical consolidation and makes for a fantastic pairing with the 12 Classics. I like this headphone as-is but it’s much more lifelike with the Trinity Go. I’m thoroughly impressed. There’s just more tonal textures and engagement with this magnetic conduction tech. It brings this vividness and conviction to the music. It also smooths out this etchiness in the upper-midrange, lower-treble I didn’t notice before. There’s also this sense of newfound inner spaciousness. I love this headphone and thought it sounded great without mods. However, without the Trinity Go, the Meze 99 Classics is flatter, fuzzier, less rounded, less quiet, and just not as involving. This pairing is extraordinary to say the least. If you own a Meze 99 Classics, this is a worthy accessory. The dynamics, solidity, and clarity gained from having the Trinity Go cannot be understated with this headphone. It brings dimensional weight and richness to the recordings which make for a very palpable experience. Basically, once you hear the Trinity Go with the Meze 99 Classics, you won’t be returning it. I know the Trinity Go is for portable use but I was curious of its effects on larger cans. 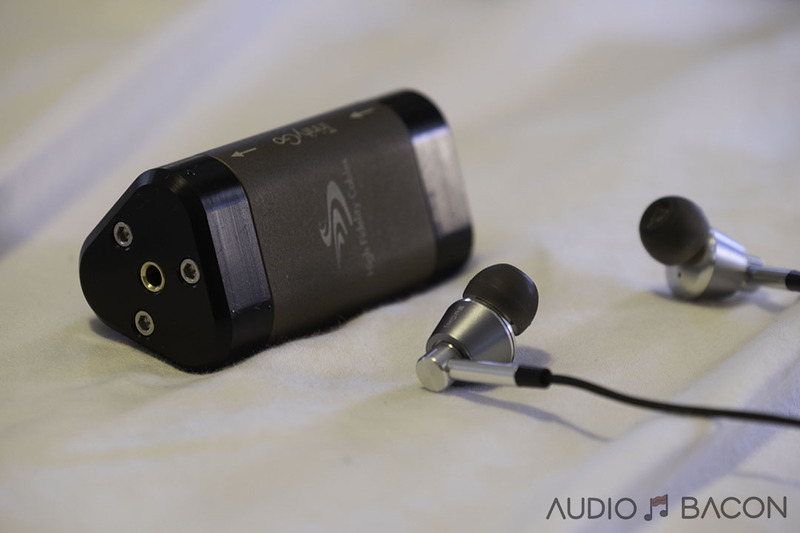 Surprisingly, it transforms the Abyss into a much more intimate and punchier sounding headphone. Timbre and tonality are more convincing and there’s a lot more meat on the bones but the tradeoff is a loss of a bit shine and resolution. Background is also not as quiet and there’s a loss of air and detail that’s quite noticeable. Without the TG, the sound is more insightful and has a wider and deeper soundstage. Which is odd because it seems to improve depth and air in the aforementioned IEMs. The sonic smearing is a bit bothersome for me but what I do like more about having the TG with the Abyss is the sweetness and accuracy of female vocalists. This is probably my least favorite pairing. The Trinity Go had a similar impact to the Merlin V2 as it did with the Abyss. More punchy, warmth, coherence, and tonal textures but it doesn’t sound as airy/open, detailed, or transparent. That said, the TG smooths out the rough edges. It provides the low-end with more textures, which results in a very rhythmic, consolidated, coherent, and calm sound. There’s a noticeable improvement in vocal timbre and overall presence and tonal weight across the spectrum. Without the Trinity Go, the sound is cleaner (and thinner), more revealing, and has a quieter background, but does sound a little unorganized and “floaty.” The Trinity Go provides a more fluid and organic sound. This could be a toss up as far as mood and preference. These are my personal pair of CIEMs and I did get them due to their sound signature. With the Trinity Go, the sound is a bit more congested and murky. It’s not as detailed but provides a smooth and sultry sound. For whatever reason, the synergy wasn’t great with the TG with this one. I’m not sure if it’s due to its 8 x BA drivers? (shrug) Can’t win em all. I really enjoyed the Trinity Helix with the HEK V2 so I thought it’d be interesting to hear how the little brother performs. Long story short, if the Helix is out of your budget, get the Trinity Go. For whatever reason, the HEK synergizes very well with this magnetic technology. It solidifies the sound for better coherence, more delineation, and improves the dimension and musicality of this headphone. Please keep in mind I’m using the stock headphone cable (sinful I know), but I could imagine the improvements would be apparent on an aftermarket cable as well. Removing the Trinity Go and the sound is back to being dimensionless and smeared. 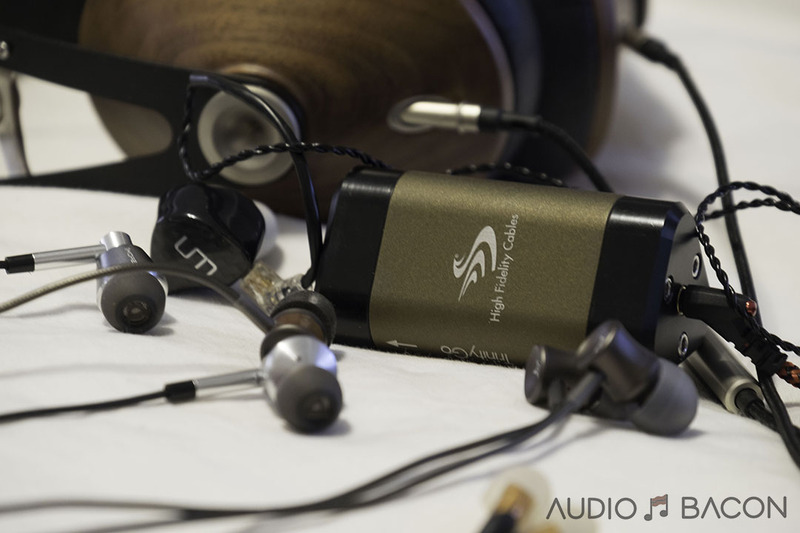 The improvements were similar to what I heard with the Meze 99 Classics. The Trinity Go provided a palatable level of balance throughout. Unlike the Abyss, the Trinity Go actually deepens the soundstage and provides a quieter background. The delta isn’t subtle and I would highly recommend the portable Trinity Go for the HEK V2. It’s a relatively affordable upgrade with appreciable sonic gains. This is an underrated (and discontinued) IEM I had laying around. The Trinity Go works miracles on this sleek bud. It did something similar to the Meze 11 Neo and 12 Classics. There’s a lack of shimmer up top and some masking of micro-details but there are these tonal cues and sonic deliberation that you wouldn’t get otherwise. 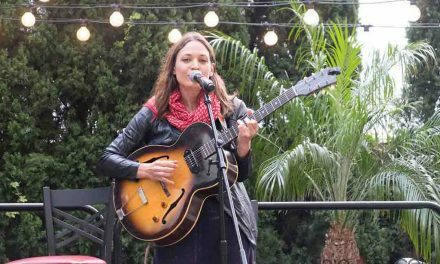 It unflattens the soundstage, tightens up the image, clarifies the lower midrange, and promotes more depth and body to instruments and vocals. Without the Trinity Go, the sound is a bit cloudy and muffled. This is another fantastic pairing. This popular IEM just got better with the Trinity Go which essentially converts it to a $400 IEM. 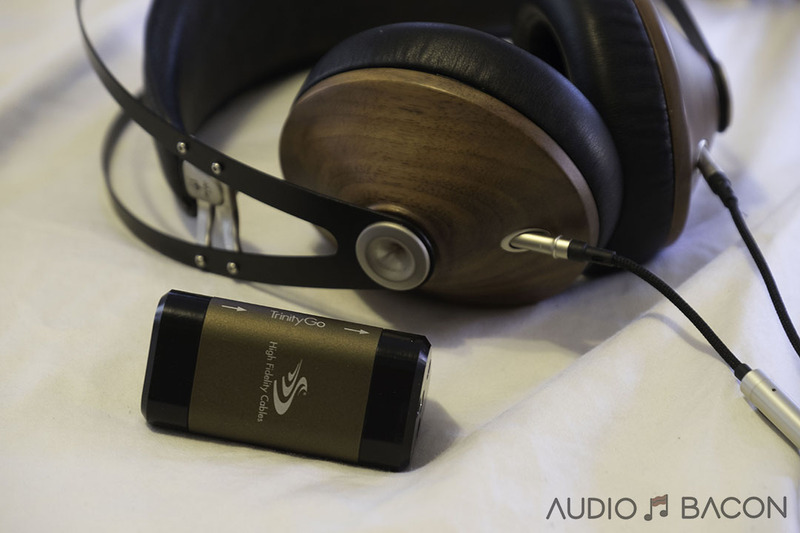 Although the Triple Driver already sounds great, it is much smoother and more dynamic with the Trinity Go. I don’t hear any drawbacks from using the Trinity Go with this one. Tone and timbre improve enormously, more depth and atmospherics, more rhythmic weight and tonal density. Simply more analog and musical. When the Trinity Go is removed, it sounds very piecewise, contrived, and almost hollow. The TG has a more forward (and proper) midrange and adds enough roundness to performers to give a natural sense of realism. This is by far my favorite pairing with IEMs. 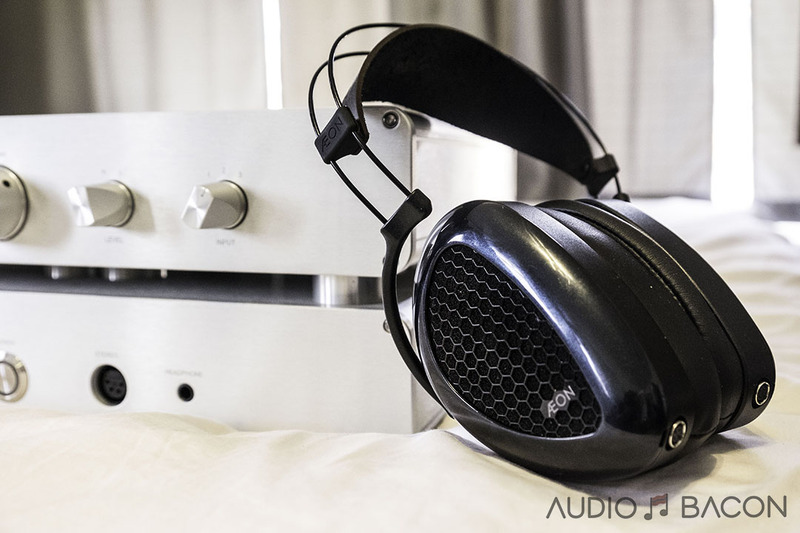 The Trinty Go proved itself to be a worthy accessory to all the audiophile nomads out there. It even worked well with some desktop headphones. I found myself shaking my head in disbelief at the sonic improvements provided by the Trinity Go for most of these headphones. Improved tone and timbre. Voices and instruments just sound more organic and realistic. Piano notes have proper tonal density, brass sounds voluminous and true, and strings are richly textured. Coherence. It’s just more musically velvety and liquid. Punchier and tighter bass with warmer overtones. Percussions were delivered with delicious slam and definition. 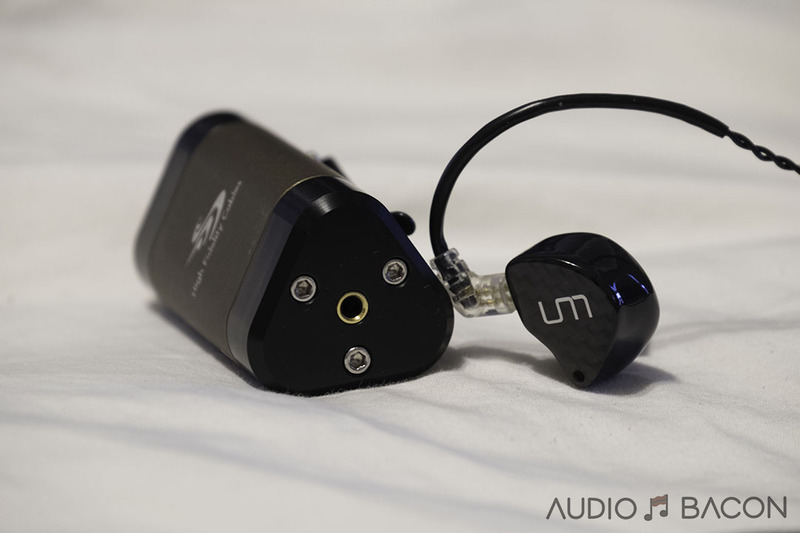 Tightens up the image in a majority of the IEMs/headphones tested. Rolls off a bit of treble energy which works well with IEMs that could be fatiguing over the long-term. Body. This is a big one. 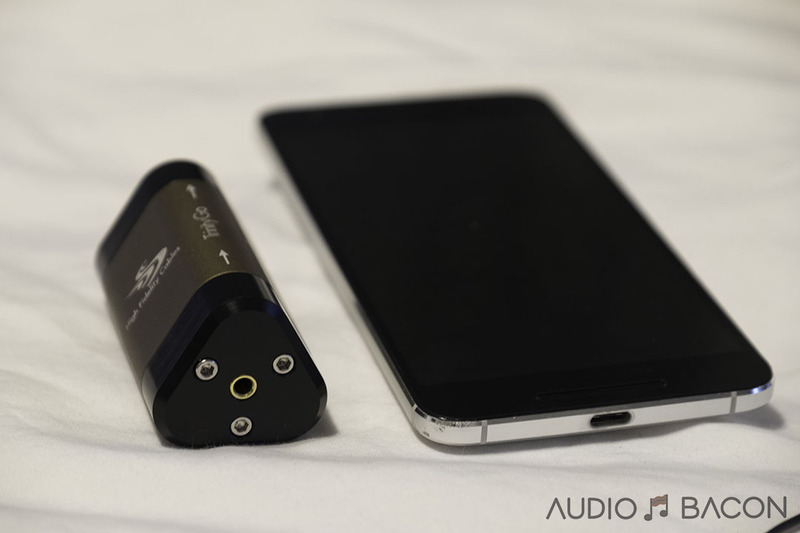 Typically you’ll have to swap out your DAC to get more of that contouring around human voices and instruments. Somehow the Trinity Go is able to provide this roundness in the analog domain. 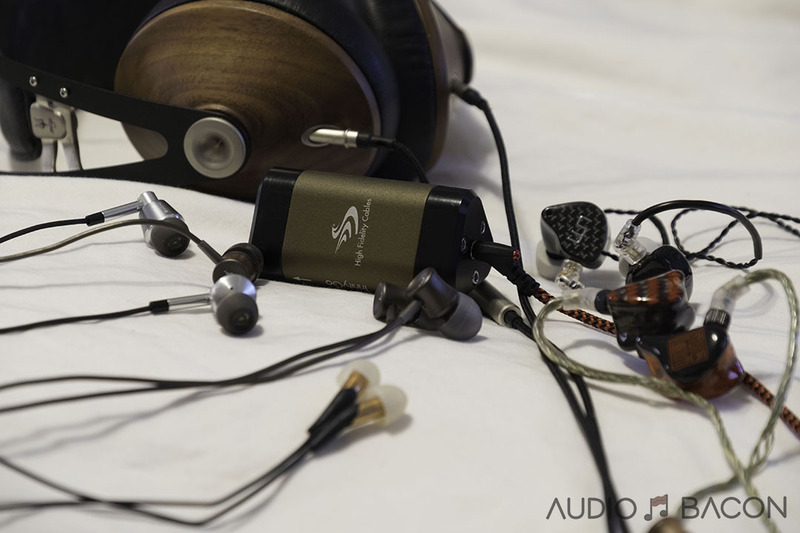 This is clearly audible in the Meze 99 Classics, 1More Triple Driver, and HiFiMAN HE-1000 V2. For those who enjoy a more analytical, airy, and detailed sound, the Trinity Go might not be a good fit, at least with this V-Moda copper aux cable. I surmise this could be mitigated with a silver auxiliary cable rather than the V-Moda copper. However, if you’re the type that likes to swap between analytical and lush/warm, the Trinity Go becomes an adaptive device. Consolidation comes to mind when I listen to the Trinity Go. It’s as if some of the sonic bits are scattered all over the place and the Trinity Go puts them back together in a fluid and articulate manner. There’s no glare or harshness, just easy, silky, rhymic, and smooth listening. It’s surprising how far some of these IEMs and headphones were elevated with this little device. This new magnetic wave guide module simply provides a more accurate and tuneful musical experience. At $299, this module isn’t cheap, but admittedly better than spending $400+ on something that strays too far from acoustic comfort. Of course, synergy isn’t guaranteed so High Fidelity Cables offers a generous 30-day risk-free trial. I also suggest bringing your daily drivers to the next trade show and check out the Trinity Go for yourself. More likely than not, the Trinity Go will transform your favorite headphones into something more engaging and lifelike. This thing seems really interesting. Will likely try this for my new Nightowls. I got mine few weeks back, and it sound very bad and I want to be honest. My chord Mojo sound a lot better without it, I lost resolution, depth, transparency and midrange pushed back. There is nothing good about it at all. I get better performance with cables for less $. I’m sending my unit back and maybe it is a faulty unit and they will inspect it. Out of curiosity, which IEMs/headphones are you using? The first version of the Trinity Go (pictured with the magnets exposed) sounded pretty bad across the board. I told HFC about it and they sent me a second revision which is much better. What you described sounds like what I heard with the Angie, Merlin V2, and Abyss. On the flip side, the 1More Triple, HE-1000 V2, and Meze 99 Classics seem to synergize much better with the Trinity Go. I have mrspeaker Aeon, and the sound was the same on both sides and this why I’m sending it back. maybe defective one. But in your review you mentioned a lost in transparency which I think is not good in general for the sound quality. I’d like to ask about your unit, do you feel the volume goes down little bit with it ? I received my replacement, and now we can talk :P.
This thing gives Dense sound and removes the glare from midrange and more define bass with touch of speed. As I already have a DAVE and HEK V2 (and very pleased with the combination), the Triniy Go sounds interesting. But there is a huge difference in size and price between this and its big brother Trinity Helix. Is there also a big difference in performance (when usee with the HEK in particular)? I’ve heard there may have been a new revision to the Trinity Helix but from memory, the two sound very different. The Trinity Helix uplifts the tone a bit but provides better transparency and tonal density. What I hear from the Trinity Go + HEKV2 + stock cable is mostly the contouring of the instruments and vocals. I can’t speak on how it would sound with aftermarket cables as I recall huge improvements by using a DHC Complement4. Interesting review. I’ve identified HFC’s UK dealer and will see if they’ve got a Trinity Go to demo. Can you offer a few words on compatison between the Trinity Go and the Trinity Helix? 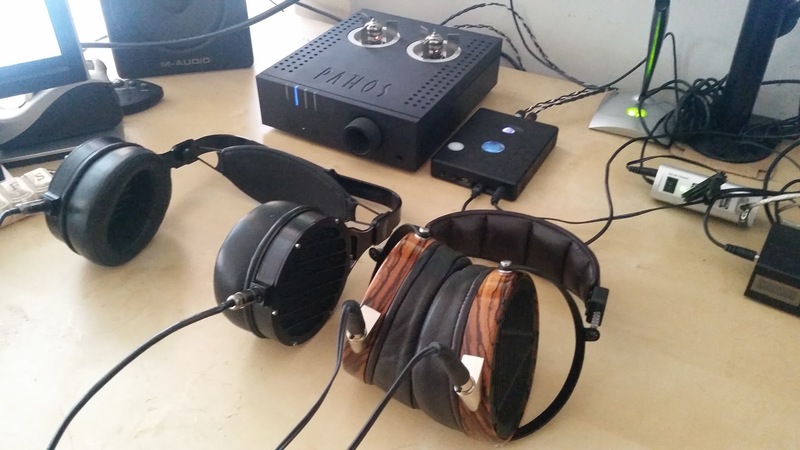 I have a Chord DAVE and Focal Utopia with a Prion4 cable, and have just received my HE1000v2 upgrade, which I can use with the Prion4 via a DHC adapter I have. Just wondering what would be a sensible choice of cable to use connecting the DAVE to the TG. Cheers.